AS Malaysia gears up to developed nation status by 2020, there is still much to do to get there. One of the most direct ways to arrive at the vision is to ensure a sufficient and growing number of engineers. Increase in the number of engineering students is paramount to meet the nation’s need for engineers who would implement and maintain the many economic development projects. During his visit to the International Bureau of Education (IBE) in Geneva in April, Deputy Prime Minister Tan Sri Muhyiddin Yassin spoke of the need for Malaysia to harness skills and knowledge in Science, Technology, Engineering and Mathematics (STEM). Muhyiddin also pointed out that the countries which started on the same level as Malaysia had moved much further ahead, crediting it to their wisdom in making full use of STEM to boost their country’s fortunes. As such, he emphasised the need for human capital development in STEM, which he considers vital in the national transformation process. To achieve this, a strategy comprising a series of actionable plans must be able to support the production rates needed for generating skilled STEM human capital at two levels, namely secondary schools and tertiary institutions, to reach the target of 500,000 STEM graduates by 2020, according to Muhyiddin. Although the solution is apparent, its execution remains challenging. One of the factors hindering this step to greater national development is getting students to love science, or science classes. Science and mathematics as school subjects must be made interesting, easy to understand, as well as more hands-on and exploratory. This is in line with the Government’s aim for 60% science and technology-based education by 2020. For the engineering profession, interest in science, technology, engineering and mathematics in school will result in more qualified students who are eligible to pursue engineering courses in universities. Through the increase in engineering students, the nation’s need for engineers would be met. This would translate into greater implementation and maintenance of the country’s economic development projects. 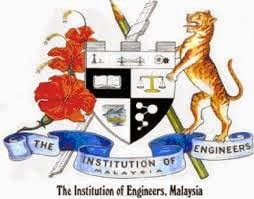 The Institution of Engineers Malaysia (IEM) lauds the Government’s effort to promote interest among students to study science in schools. 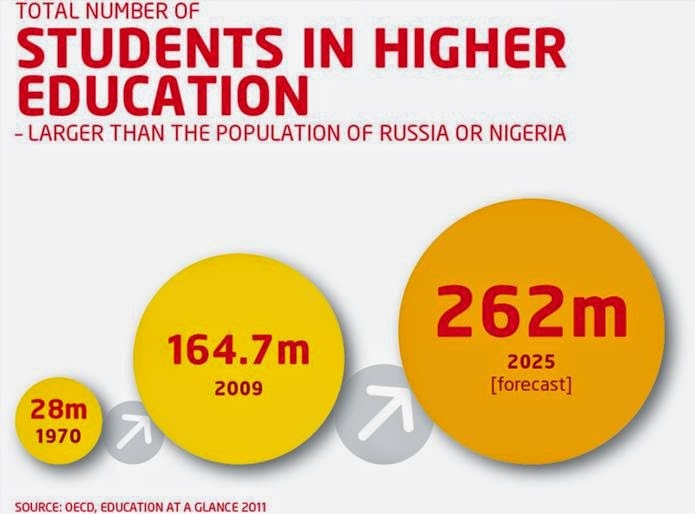 Without the large number of science students, there will surely be a corresponding limitation in the ability of universities to produce the number of engineers needed. As a national association with the nation’s interests at heart, IEM has been actively involved in conducting school career awareness talks, arranging competitions and exhibiting interesting projects on engineering to school children to promote interest in engineering. IEM has also set up IEM Student to encourage students to choose sections in various universities in Malaysia. Engineering students are also encouraged to join IEM as Student Members which will enable them to access IEM resources and activities such as talks and networking. IEM is one of the supporting members (together with AAET, MiGHT, Utar and NSC) for the Kuala Lumpur Engineering Science Fair, an annual programme to promote interest in STEM among primary and secondary school pupils. We believe that career prospects will be a major factor in the students’ decision in their studies and career options. Prospects for engineers include top level positions, attractive remuneration as well as status recognition, which will be a great motivation for students to take up STEM Education and thus pursue a career in engineering. Students must be made aware that job prospects for engineering graduates remain bright as Government allocation for infrastructure development has supported the demand for engineers. National development towards an industrial nation has also spurred the demand for engineers. Students, and parents too, must realise that a career in engineering is not only limited to the five traditional branches of engineering, namely Civil, Mechanical, Electrical, Electronic and Chemical Engineering. Through the years, engineering has expanded into many new disciplines such as Aeronautical Engineering, Environmental Engineering, Maritime Engineering, Mining Engineering, Oil and Gas Engineering, among many others, which would be exciting career options for students. The Government being the largest employer should provide equal opportunity and create a structured pathway for all science-based professionals, in particular engineers, to take up high positions in the civil service. Recognition of the contribution of engineering success and seeing it as a pathway to top positions in the civil service will be a great motivator for students to pursue STEM education in Malaysia. professional engineer (P.Eng.) 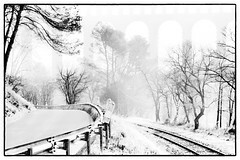 with the title “Ir” as required by the Board of Engineers Malaysia (BEM). An eyesore: Mitigation works being carried out to restore the cleared slopes of Bukit Relau. GEORGE TOWN: The Penang Island City Council has come under fire for taking such a long time to tackle the illegal hill clearing at Bukit Relau. Bayan Baru PKR MP Sim Tze Tzin (pcs left) said it should not have taken so long to carry out mitigation work at the 22.89ha site which became known as Botak Hill after it was cleared. “When the issue broke out in 2013, I called a senior council officer who told me that it would be settled within six months. “But after two years, the problem is still not settled. “This is not rocket science. What is so difficult?” he told a press conference yesterday in Sungai Dua near here. Sim said someone should be held responsible for the delay and urged the state to find the culprit. “The person has to be punished as this has to do with accountability. “If you cannot do the job, then resign to let other people do it,” he said. GEORGE TOWN: Mitigation works on Bukit Relau, infamously known as Botak Hill after a section of its top slope was cleared in 2013, is scheduled to be completed by October.The Penang Island City Council (MBPP) said the mitigation works started in April and was expected to be completed in six months. 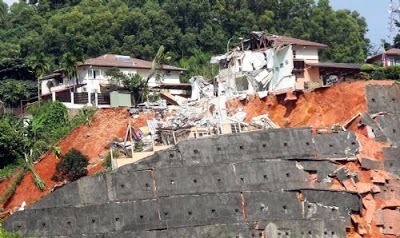 The council said it had endorsed the Erosion and Sedimentation Control Plan (ESCP) and slope strengthening design to mitigate landslips and pollution caused by mud flow based on the proposal by the geotechnical consultant appointed by General Accomplish-ment Sdn Bhd which owns the cleared site. 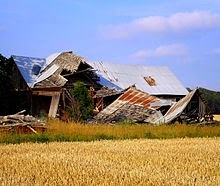 MBPP said the mitigation plan was vetted by the state’s Hillside Geotechnical Advisory Panel chairman Dr Gue See Sew. General Accomplishment was fined RM30,000 by a Sessions Court here in July 2013 after a represen-tative pleaded guilty on behalf of the company to clearing the 22.89ha site between April 24 and May 8 the same year without obtaining written approval from then Penang Municipal Council (MPPP). The offence under Section 70 A of the Street, Drainage and Buildings Act 1974 carries a maximum five-year imprisonment or maximum RM50,000 fine, or both. MBPP said in a statement yesterday that the mitigation measures include the building of a few catchment and sedimentation ponds along the access route to the site, cutting the slope to reduce its steepness and covering the exposed slope with vegetation. The council said the works also involved the building of cascading drains along the access route to dissipate the energy of surface runoff and mitigate soil erosion. Several residents living nearby had earlier this month raised their concern after seeing earthworks being done at the site. 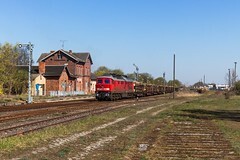 MBPP said the land cutting was done to allow access for heavy vehicles and to carry out rock blasting. It said huge boulders needed to be removed to ensure a safe route and for the mitigation works to proceed, adding that the rock blasting was approved by the Minerals and Geoscience Depart-ment and police. MBPP said it would continue to monitor the works to ensure that it was carried out in accordance with the approved mitigation plan. Hiking as a family has built strong bonds, made beautiful memories and improved health. And everyone has learnt to be more creative in tackling obstacles as they are no longer couch potatoes! THE day I traded my high heels for hiking shoes, the malls for hills and the stale city air for fresh jungle air, my life was never the same again. It all began when my dear hubby Adrian Yeong took up hiking. He had been hiking close to six months to improve his health and fitness when I saw the changes in him: he had shed 13 kilos and was much fitter and healthier than before. Finally one day, I agreed to join him. Wasting no time, he got me my first pair of hiking shoes. I had my first taste of hiking at the Challenger trail in Gasing Hill, Petaling Jaya, on August 1, 2010. Since then, Gasing Hill has become our regular training ground. Friends who heard of our hiking activities thought we were crazy to hike three times a week and when they learnt that we also brought our younger four children along with us, in their dictionary, we were well…insane. Why bother doing such tiring activities? 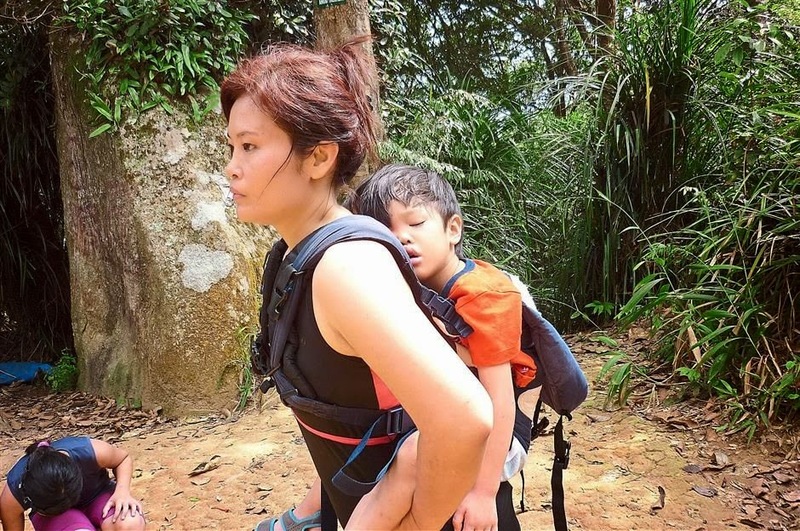 The writer carrying her youngest son, Joseph, on her back, while climbing Gunung Datuk. By training our children, who were then one-plus, three, seven and ten years old to hike, all of us eventually got fitter and stronger. Our speed and endurance improved. In a short span of five months, Adrian and I did 50 hikes while our kids went on 30 hikes with us. We had explored almost all the hills and a few waterfalls in the Klang Valley. After a while, it felt a bit boring hiking the same hills. I dreamt of exploring further but often doubted if we were up to the challenge of hiking more than an hour plus with our young kids. Little did I know that one day I would get to know a Facebook friend, Michael Mui, and that our feet would soon hit real mountains. Mui got to know of our family hiking activities and invited us to join him to hike Gunung Angsi and Gunung Datuk (both in Negri Sembilan). In his own words, he described these mountains as “a stroll in the park!” That was our first event with the Freewill Hikers Club, a dynamic hiking group based in Johor led by Captain Richard Yeoh. My husband, being an adventurous guy, took up the idea immediately and the rest is history. 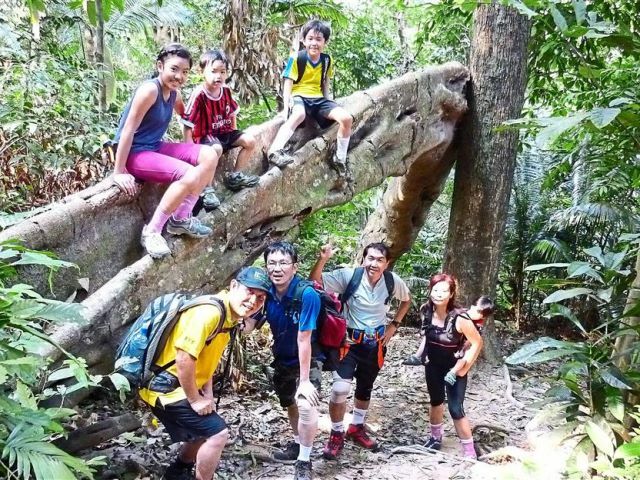 On August 11, 2012, Adrian and I, together with our young hikers, hiked our first two mountains Gunung Angsi and Gunung Datuk, on consecutive days. My two kids Audrey (then aged 12) and Dylan (nine) hiked on their own accompanied by our new friends while I carried Joshua (five) on and off as he happened to be a bit moody in the beginning. 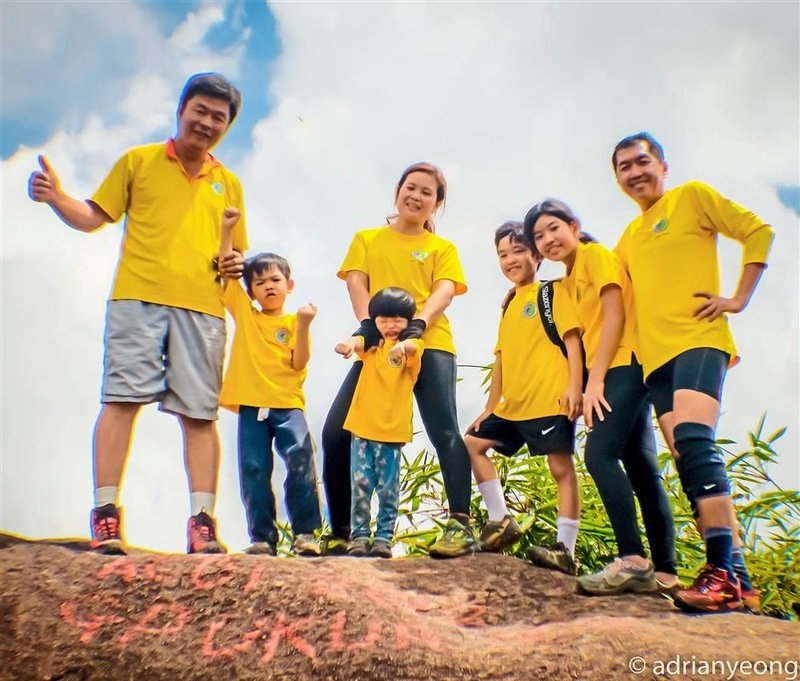 The writer with her husband, Adrian Yeong, and their kids on the peak of Broga Hill, Selangor. My capable hubby backpacked Lil Joseph (three years old and 12kg in weight) up to the peak of Gunung Angsi and back. Hiking more than an hour with heavier loads than other hikers made it tough. To make matters worse, wearing the new hiking boots I got him as a surprise, he twisted his ankle during the hike. Despite having applied some ointment over the night, he still had not recovered from the injury and so I volunteered to backpack Lil Joseph up Gunung Datuk the next day. I remembered assuring my dear hubby that I would hand the little boy over to him should the going get too tough. My hubby agreed to my suggestion. That was my first hike carrying my son up a mountain. It was my first experience and I found Gunung Datuk to be a steep mountain, with endless roots along the way. Carrying my little boy up weighed me down though I found it quite easy to go on all fours, pulling myself up by tree roots. Our new friends from Freewill Hikers were very helpful and took care of our two older kids, Audrey and Dylan. While Audrey was slow and steady, Dylan flew up with them and managed to reach the peak in 1 hour 40 minutes; whereas, with my load, we took about 30 minutes more. It was tiring and our friends kept bluffing us — “You are almost there”, “15 minutes more to the peak”, “Just another 15 minutes more” — in the name of encouragement. 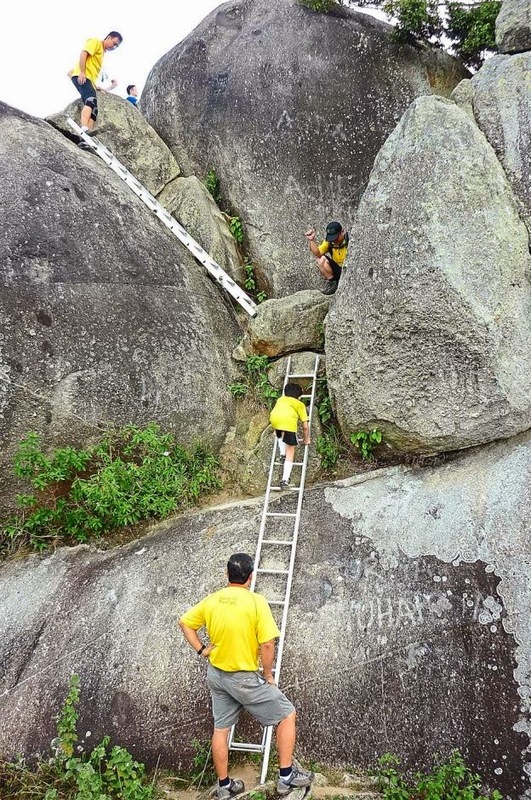 To reach the actual peak of Gunung Datuk, the writer’s family had to clamber up these ladders. I handed my little boy over to my hubby to tackle the metal ladder that leads to the actual peak of Gunung Datuk as I was just too exhausted. We had all made it up to Gunung Datuk! Those were our first two mountains — tough but rewarding. The next few months that followed saw us at Gunung Lambak, Gunung Belumut and Gunung Panti (all three in southern Johor, near Kluang). Our toughest hike with Lil Jo was Gunung Belumut. Our little boy now weighed 15 kilos and he had not been trained as he was small. He also often pretended to be a 4WD stuck in the mud whilst hiking with his siblings, an idea he got from the multiple off-road trips we had gone for. 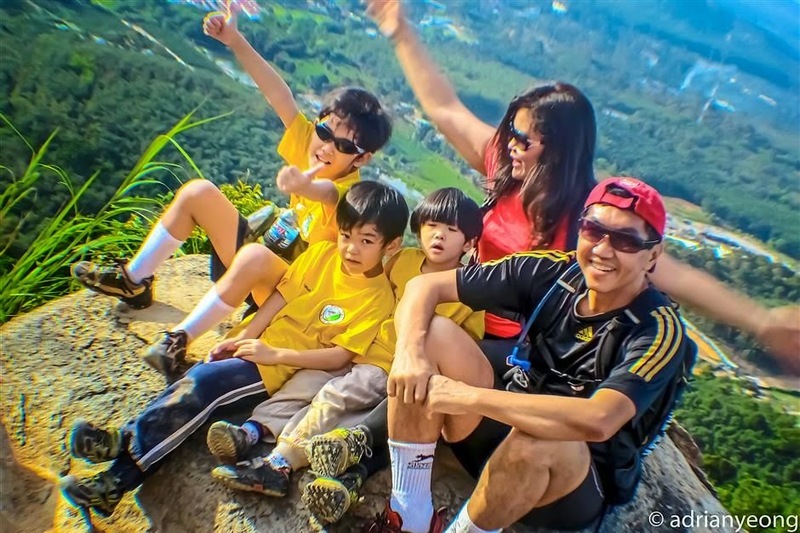 The writer (centre) with her children, husband (right) and Lee Keam Keong of Freewill Hikers at the peak of Gunung Belumut (1,010m) in Kluang, Johor. So I promised him and we went hunting all the way. He played with twigs, pretending they were rifles and he was soon blasting and shooting away, chasing his brother Joshua and another a new friend, a boy about six, named Rain, who was the grandson of Captain Richard Yeoh of the Freewill Hikers Club. He played all the way and when he was tired, I gave him some drinks to boost his energy. I also talked, joked and laughed with him in order to distract him from the distance we had to cover. Lo and behold, my four-year-old boy successfully hiked up to the peak in four hours without being carried. It was a miracle indeed. My prayers were answered. On the way down, Lil Joseph was now tired and had to be carried by his strong daddy. Adrian later shared that it was easier to carry a 15kg bagpack rather than our little boy as he kept swaying to and fro in the baby carrier as he tackled the tough steep terrain, squeezing through tight spots and at times jumping over gullies and large tree roots. After descending for over two hours, his neck and shoulders were stiff. Nothing worthwhile comes easy, and we’ve had to build up our strength as well as our endurance in hiking. Being positive has made us conquerors. With sufficient training and preparations, we’ve tackled various mountains. Our conclusion on hiking with kids: it’s not easy and did not happen overnight. But it’s not mission impossible either as kids have new engines and are fast learners. By clocking the hours and allowing them to master hiking skills, we’ve built up their fitness and confidence. After time, they have become capable hikers. Hiking together as a family has been rewarding as we’ve built strong bonds and made beautiful memories. We’ve inculcated healthier lifestyles and our children have learnt to tackle obstacles, to never give up and be optimistic. 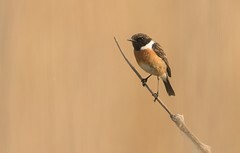 It has taught them outdoor skills and built their appreciation of nature. It has made them strong, courageous and creative. This is a win-win situation and I strongly encourage families to take up hiking as a regular family activity. Just make a change in your life and that of your family. Bring them out hiking. All you need is a good pair of hiking shoes, determination and motivation. Go for it folks, don’t be a coach potato! 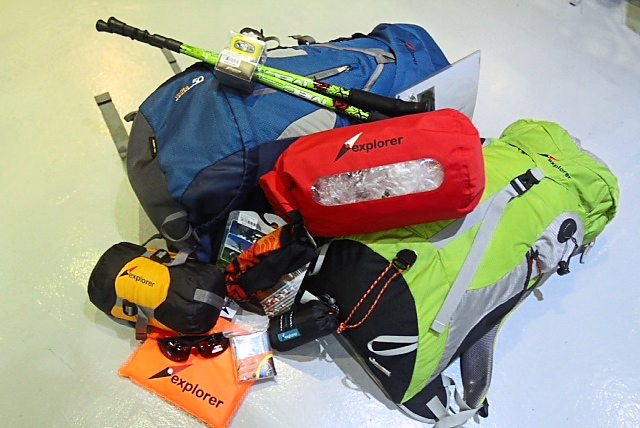 Backpacks, trekking poles, head lamps, a dry bag, a sleeping bag and a poncho are among the prizes being offered for those who write in about their Star2 Adventure Challenge. Wake up and live: Hiking can build confidence, health, endurance, stamina and fitness! Shereen Teng clambering up rocks at Gunung Rinjani. It took death and sickness to make one girl change herlife… and start hiking…. Barcelona (AFP) – With a smartphone that slots together piece by piece like Lego, US Internet giant Google is trying to reinvent the mobile as most phone makers are honing sleeker handsets. The company aims to challenge its rival Apple’s thin iPhones with the Google Ara project, giving smartphone aficionados the option to build their phone themselves. Analysts say tech boffins will love it but remain cautious about how popular it may be compared to polished conventional smartphones that sit snugly in the palm. 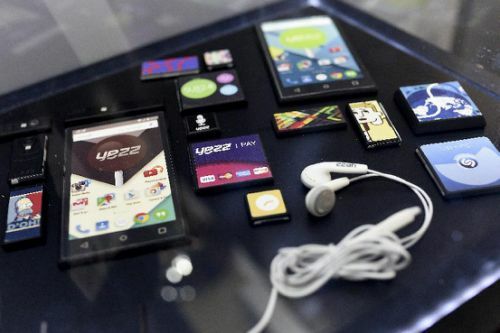 Google’s associate, US firm Yezz, presented a prototype of the build-your-own device this week at the Mobile World Congress in Barcelona, the world’s biggest wireless telecom trade fair. “That is good for the environment,” said Annette Zimmermann, a telecom specialist at German consultancy Gartner. 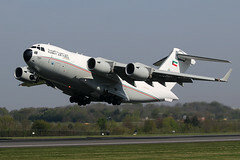 Ara “could reshape the mobile landscape,” said Paul Eremenko, director of the Ara Project, in a presentation to experts in January. 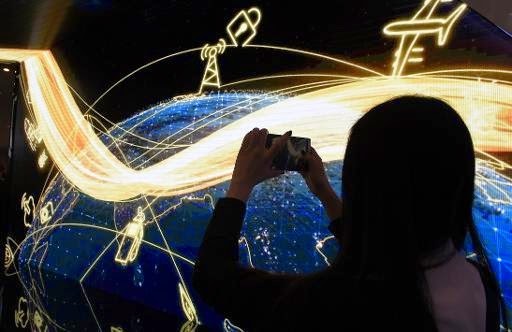 He said it aimed to gain six billion potential clients — the current billion people who currently use smartphones “and five billion future users”, most of them in emerging markets. Google says a mid-range Ara phone could cost between $50 and $100 to produce, but has not given details of the likely sales price, leaving questions marks over how sustainable such a product would be. “Google is not looking to make money directly with Ara,” said Jerome Colin, a telecom expert at French consultancy group Roland Berger. Tech fans and bloggers queued up to see the prototype presented in Barcelona, but analysts were sceptical. “The trend in mobile phones is to have small, thin, really integrated products. If you make a product modular it immediately means that you’re going to have to make compromises on that,” said Ben Wood, head researcher at consultancy CCS Insight. “The other question mark I have is: beyond geeks, who really knows” about components? he added. “We need to resolve the paradox of choice,” he said in January. “We will have to see if the public takes to it,” said Zimmerman. Google dominates the world of Internet searches and its Android operating system can be used on 80 percent of the world’s smartphones. It also holds a large market share in wireless tablet devices. Its senior vice-president Sundar Pichai said in Barcelona on Monday that it was in talks with telecom companies about possibly using their networks to operate its own mobile phone services in the United States. American technology giant, Apple, has issued a public letter of apology to Chinese consumers over the company’s warranty policies in China. Apple’s CEO Tim Cook signed the statement, saying the company is sorry for any “concerns or misunderstandings” that have been caused. In the letter, Cook said that over the past two weeks, Apple has received feedback concerning its warranty policies in China and the company has “reflected” on this. He said APPLE takes the feedback seriously and is seeking to allay concerns that the company was being arrogant by not responding to them. He said this was due to lack of communication on Apple’s part and that it was sorry for any inconvenience caused to consumers. In the statement, Apple said the company is making four major adjustments to improve its after-sales services for Chinese consumers, including improving its warranty for iPhone 4 and iPhone 4S, enhancing supervision over and training for authorized service providers. APPLE’s apology comes after the China Consumer’s Association asked Apple to “sincerely apologize” to Chinese consumers and “thoroughly correct its problems,” after taking little action to address criticism, started by China Central Television , which exposed Apple’s after-sales services failings in China in a special TV program. The CCA demanded that Apple inform consumers if refurbished parts are used when repairing broken devices, and that repair costs should be calculated accordingly. South Korea, Australia and Italy have filed similar claims against Apple, citing cases where refurbished products had been used to repair damaged iPhones, higher prices had been charged and its failure to publish warranty information in those countries. Why call US tech giant rotten Apple? KUALA LUMPUR: About seven million smartphone users nationwide are exposed to threats from cyber hackers who make use of their gadgets to steal their money. Bukit Aman Commercial Crime Investigation Department director Datuk Syed Ismail Syed Azizan said lack of awareness on the risks of smartphone security made users easy victims. The scam was detected via applications such as “Type-On” which, when downloaded, would cause smartphone users to bear the cost although they had uninstalled the application. Lookout Mobile Security was quoted by AFP as saying that worldwide, users lost millions of dollars last year via malware and toll fraud that attacked smartphone users for accessing applications from unofficial sources rather than trusted ones such as Apple or Google online shops. Syed Ismail said police statistics recorded from January to September this year showed that losses incurred via SMS or phone calls totalled RM21.8mil. The hackers target users of Internet banking or phone banking by hacking and abusing the network, including the online purchases of goods. There’s no doubt that the iPhone 5 is going to be a great, fast-selling smartphone, but it’s out-innovated by Nokia and Samsung. Here’s what it is: a strong improvement to the iPhone 4S that offers up a larger screen, 4G LTE speeds, and a terrific camera. The iPhone 5 carries on the goodness that Apple excels at, like iTunes entertainment and cloud storage. Samsung’s Galaxy Note 2 is the anti-iPhone. 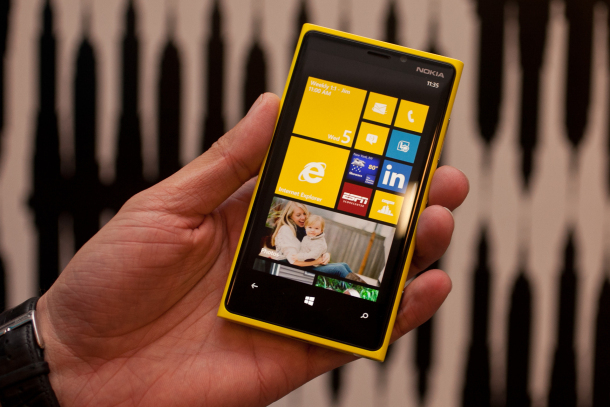 The Nokia’s Lumia 920 offers wireless charging, for example, a capability it’ll pilot in coffee shops and airline lounges. Its camera is literally surrounded by springs, and the screen uses a very smart display filter that could match or even surpass the iPhone 5’s display (we have to wait to see them side by side. Meanwhile, Samsung’s Galaxy Note 2 offers up an enormous 5.5-inch screen and a truckload of tricks with its S Pen stylus, and a new camera feature that will compile the best of a handful of group photos, increasing the chances that everyone’s smiling. Its phone/tablet hybrid is the antithesis of the smaller iPhone screen. On the battery front, Motorola‘s new Motorola Droid Razr Maxx HD can’t be beat; it features a powerful 3,300mAh battery that promises 21 hours of talk time to Apple’s 8 hours of talk time over 3G on the iPhone 5. Make no mistake that the iPhone 5 will sell like wildfire and bring delight to Apple fans everywhere — in fact, I even think it makes for a great universal choice. 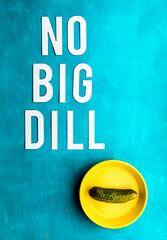 Yet its lack of a “gotcha” feature gives shoppers considering other powerful alternatives — like the intriguing Lumia 920, the larger-than-life Samsung Galaxy Note 2, or even the won’t-quit Motorola Droid Razr Maxx HD — fewer reasons to stick with Apple.